The other day, I was walking the kids to school from our parking spot nearby when they accused me of making them late, insisting I was a "slow poke." I pointed out this could not be true because I was, in fact, many strides ahead of them, at least a quarter of a block ahead, when they said it. At this point, the girl, AKA Thing 2 (because she's the second born of twins), took off on a tear, zipping in front of me and gleefully shouting, "I'm a fast poke!" I asked her where she'd heard that before. "I just made it up," she said. At which point, the boy, AKA Thing 1, tore past me, shouting, "I'm a fast poke too!" I had to write it down because I'm afraid if I don't, I won't remember this stuff; it'll too easily get lost in the shuffle of filling out permission trips for field trips, making the 100th lunch of the school year, and tying yet another loose shoe lace. When I picked them up from school the other day, I stopped the car at the corner and noticed the puffy clouds, covering a swath of sky in cotton-ball softness. I pointed them out to the kids. 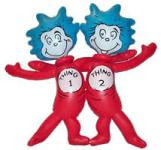 "I wish I could go up there and touch them," said Thing 2. Thing 1 then commented, "I wish I could stay up there and meet Cupid. 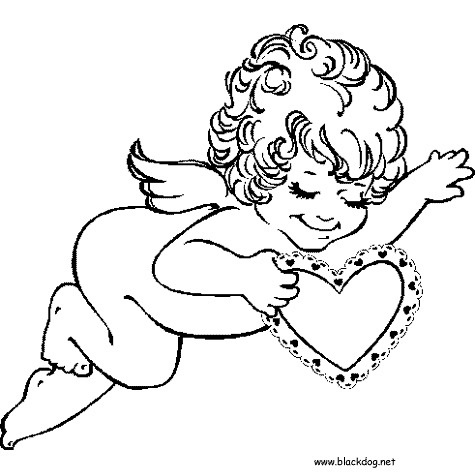 Is Cupid real, mommy?" I think I'm in love. So I guess the answer to that would be yes. Of course, this was followed quickly by the same question about Zombies. It's not all sweetness and light around here. But I am trying to savor the moments that are ... and forgive my kids or myself for the moments that aren't. The kids often put me in mind of those car commercials where the announcer brags that the car can go from 0 to 60 in X number of seconds. Only in my kids' case, they go from adorable to impossible. You'd think, by now, I'd react by not being impossible too. After all, I've had this mom gig for six years. But I can turn on a dime too. Getting them to get dressed, eat breakfast, brush their teeth, get their shoes and jackets and backpacks on in the morning turns me into a drill sergeant, and I really don't want to be. Neither does Late Blooming Dad. But some mornings, it takes the two of us, barking at both kids, threatening to take toys and privileges away, to get them out the door in something approximating on time. The other day, after Thing 1 had been dawdling and refusing to listen and preferring to take his sweet time with every task, or just plain refusing to do them, the parental haranguing escalated, with raised voices, and suddenly it was too much for the kid to take. He burst into tears and declared, "I feel hated." Late Blooming Dad responded by taking everything down and delivering a heartfelt hug. I joined in briefly. But I couldn't help feeling guilty for hours after. All I'd been trying to do was get the kid ready for school on time, and he felt hated. Tomorrow morning, the sticker chart goes up and we try a new approach: twenty on-time days -- a sticker for each -- will mean a new toy. But the real change has to be in our attitudes as parents. Yes, we need to get to work on time, and that means getting the kids to school at least close to on time. But the haranguing only led to stress for all concerned, and a decidedly sad family moment. I did feel better that afternoon, when I got to school and the door to Thing 1's classroom opened as the bell rang. Thing 1 zoomed out of his classroom and into my arms, declared me his "true love," and gave me a kiss. His quickness to forgive is another thing I don't want to ever forget.